CAE today reported financial results for the first quarter ended June 30, 2014. 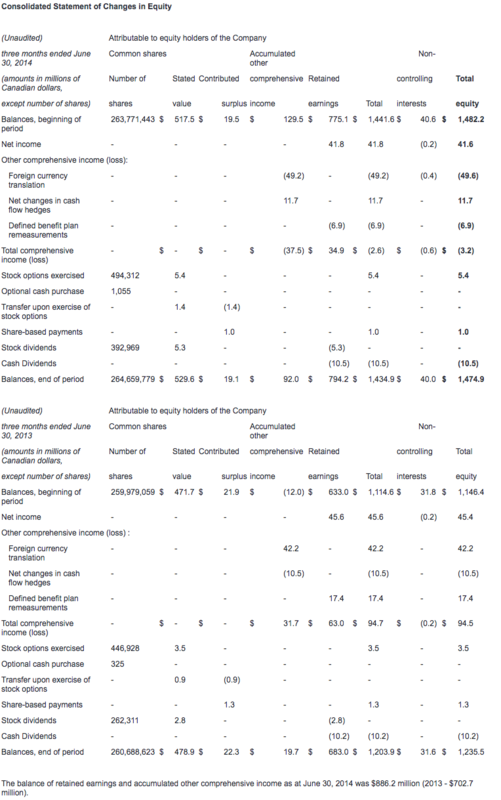 Net income from continuing operations attributable to equity holders was $43.8 million ($0.17 per share) this quarter, compared to $44.7 million ($0.17 per share) in the first quarter last year. Operating profit was $71.7 million (13.6% of revenue) compared to $61.6 million (11.8% of revenue) in the first quarter last year. Revenue for the quarter was $526.2 million, compared to $520.1 million in the first quarter last year. 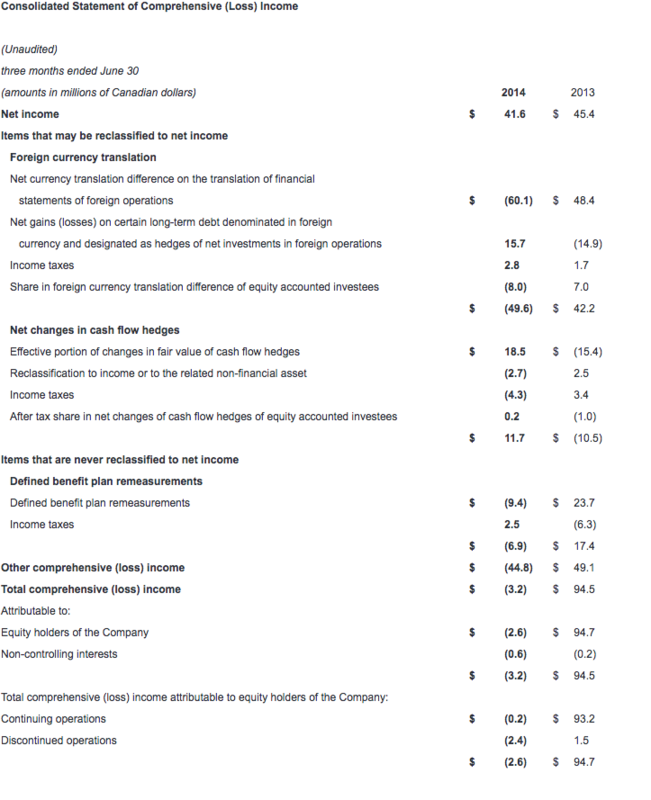 All financial information is in Canadian dollars. A strategic review of New Core Markets reaffirmed CAE's conviction in Healthcare and led to a process to divest Mining. The Company will now focus capital and resources on its three remaining core business units: Civil Simulation and Training (Civil); Defence and Security (Defence); and Healthcare. "The growth in our first quarter operating results came entirely from Civil, which saw operating income increase by 32% over last year," said Marc Parent, CAE's President and Chief Executive Officer. "Defence had stable revenue and lower operating income, owing to the mix of programs in the quarter and persistent delays in government decision-making. I am pleased to report that CAE's Board of Directors has today approved a $0.01 increase to CAE's quarterly dividend, which becomes $0.07 per share, effective September 30, 2014. This marks CAE's fourth dividend increase in as many years and is testament to our confidence in the business. As in the last few years, we expect a stronger performance in the second half and solid growth for the year as a whole." Revenue for Civil was $308.9 million in the first quarter, up 2% compared to $301.8 million last year. First quarter operating income was $49.5 million (16.0% of revenue), up 32% compared to $37.6 million (12.5% of revenue) last year. During the quarter we obtained solutions contracts expected to generate future revenues of $365.3 million, including 11 full-flight simulators (FFSs) for airline customers around the world. Orders also included pilot training services for Air Canada, Air Nostrum, Scandinavian Airlines, and British Midland Regional as well as training centre operations services for Caverton Helicopters. The Civil book-to-sales(3) ratio for the quarter was 1.18x and 1.32x for the last 12 months. First quarter Civil backlog was $2.4 billion, including our share of joint ventures. Revenue for Defence was $197.9 million, stable compared to $198.8 million last year. 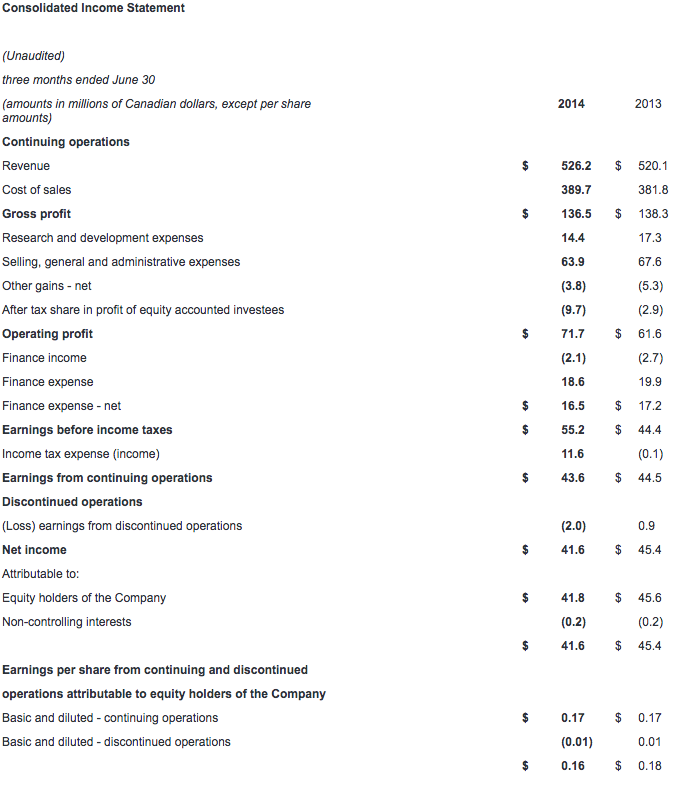 Operating income was $21.9 million (11.1% of revenue), down 7% compared to $23.6 million (11.9% of revenue) last year. During the quarter, we booked simulator orders, upgrades, and services contracts with customers including NATO for upgrades to its AWACS surveillance aircraft simulators; Beechcraft for training support and maintenance services involving the T-6C aircraft for the Royal New Zealand Air Force; and an undisclosed international customer for a KC-135 refuelling boom trainer. We had success this quarter in the naval domain with a contract for the Swedish Navy to provide a comprehensive Naval Warfare Training System. In total, we received $148.8 million in Defence orders this quarter, representing a book-to-sales ratio of 0.75x. The book-to-sales ratio for the last 12 months was 0.92x. During the quarter, we received an additional $93 million in unfunded orders. First quarter Defence backlog was $2.5 billion, including joint ventures and unfunded backlog. Revenue in Healthcare was $19.4 million for the quarter, compared to $19.5 million in the first quarter last year. Operating income was $0.3 million compared to $0.4 million last year. We continued to expand our international reach with new distributor agreements in France, South Korea and India. In terms of new product portfolio expansion, we introduced CAE Replay, an audiovisual solution for debrief used to capture both medical simulation scenarios and live clinical events. We also began production of our first Fidelis Maternal Fetal Simulators. During the quarter, we received notable orders throughout the United States and in the U.K., China and Korea from universities, hospitals and medical device companies for our audiovisual solutions, patient simulators and interventional (surgical) simulators. Income taxes this quarter were $11.6 million representing an effective tax rate of 21%, compared to nil last year. Last year's nil rate was the result of a one-time tax benefit we received in connection with the tax treatment of the depreciation and sale of some simulators in Canada. 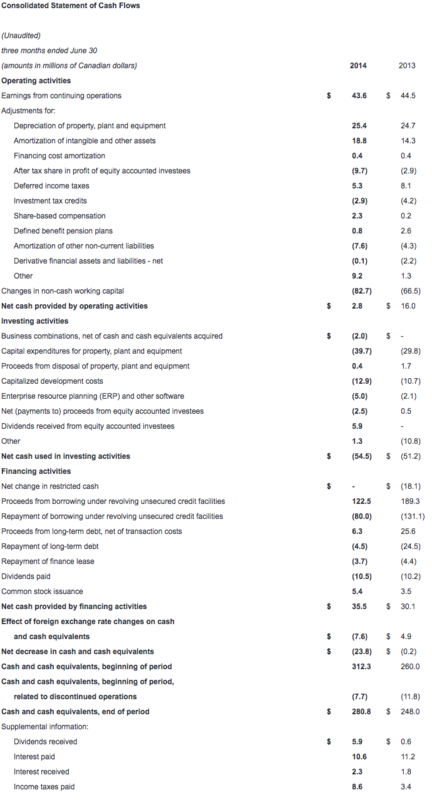 Free cash flow(6) from continuing operations was negative $20.9 million for the first quarter. The decrease from last quarter and the first quarter of fiscal 2014 was mainly attributable to unfavourable changes in non-cash working capital(7), which is due to an increase in contracts in progress assets and inventories. Capital expenditures(8) totaled $39.7 million this quarter with growth capital expenditures representing two-thirds of the total and maintenance capital expenditures the balance. Net debt(9) was $901.6 million as at June 30, 2014, compared to $856.2 million as at March 31, 2014. Our net debt-to-capital(10) ratio was 37.9%. CAE will pay a dividend of $0.07 per share effective September 30, 2014 to shareholders of record at the close of business on September 15, 2014. 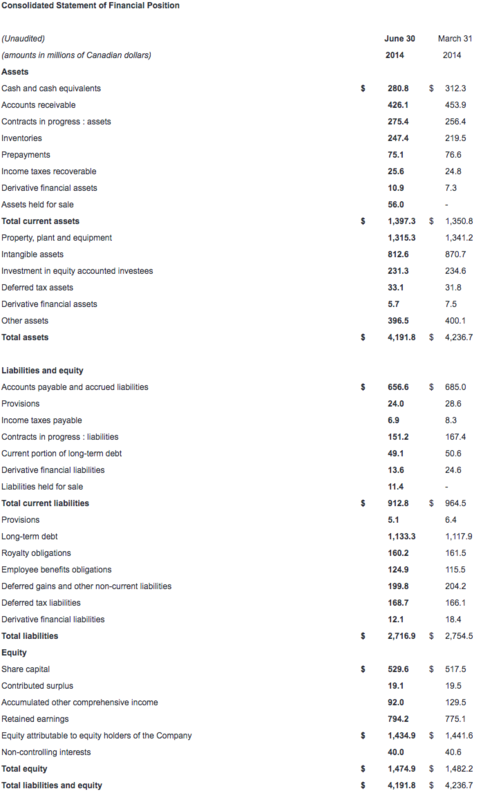 CAE's unaudited consolidated interim financial statements and management's discussion and analysis for the quarter ended June 30, 2014 have been filed with the Canadian securities commissions and are available on our website (www.cae.com) and on SEDAR (www.sedar.com). They have also been filed with the U.S. Securities and Exchange Commission and are available on their website (www.sec.gov). CAE will host a conference call focusing on fiscal year 2015 first quarter results today at 1:30 p.m. ET. The call is intended for analysts, institutional investors and the media. Participants can listen to the conference by dialling + 1 877 586 3392 or +1 416 981 9024. The conference call will also be audio webcast live for the public at www.cae.com. You will find more information about the risks and uncertainties associated with our business in the MD&A section of our annual report and annual information form for the year ended March 31, 2014. These documents have been filed with the Canadian securities commissions and are available on our website (www.cae.com), on SEDAR (www.sedar.com) and a free copy is available upon request to CAE. They have also been filed with the U.S. Securities and Exchange Commission under Form 40-F and are available on EDGAR (www.sec.gov). The forward-looking statements contained in this news release represent our expectations as of August 13, 2014 and, accordingly, are subject to change after this date. We do not update or revise forward-looking information even if new information becomes available unless legislation requires us to do so. You should not place undue reliance on forward-looking statements. (2) Total backlog is non-GAAP measure that includes obligated backlog, joint venture backlog and unfunded backlog. Obligated backlog represents the expected value of orders we have received but have not yet executed. Joint venture backlog is obligated backlog that represents the expected value of our share of orders that our joint ventures have received but have not yet executed. Unfunded backlog represents firm military orders we have received but have not yet executed for which funding authorization has not yet been obtained, in which we include unexercised negotiated options which we view as having a high probability of being exercised, but exclude indefinite-delivery/indefinite-quantity (IDIQ) contracts. (7) Non-cash working capital is a non-GAAP measure we use to monitor how much money we have committed in the day-to-day operation of our business. We calculate it by taking current assets (not including cash and cash equivalents and assets held-for-sale) and subtracting current liabilities (not including the current portion of long-term debt and liabilities related to assets held-for-sale).